Electrification on the Edinburgh-Glasgow via Falkirk High route was energised on September 2, ahead of the first electric trains running in passenger service this December. The 46-mile route is the first of four phases of the Edinburgh-Glasgow Improvement Programme (EGIP) to be energised. However, the electrics will enter traffic a year later than planned. A ScotRail spokesman told RAIL the plan was for Class 380s to begin testing on the route from October, once the safety testing process that started on September 2 was complete, with the Hitachi Rail Europe-built Class 385s then entering traffic from December. Two Class 385 electric multiple units have moved from the Velim test track in the Czech Republic to Minden (near Hanover), where they will be tested on a range of different routes at speeds up to 100mph. They will be based there until October. The EMUs involved are three-car 385002 and four-car 385101. HRE says the testing is being carried out in Germany to speed up the process, owing to the busy nature of the UK rail network. The work in Germany is in addition to that being conducted by 385001 and 385102 in Scotland. 46 three-car and 24 four-car Class 385 EMU trains are being procured to operate along the Edinburgh-Glasgow and Stirling – Alloa –Dunblane lines. The contract also comprises a 10-year maintenance deal, with plans currently in place to stable and service the trains at depots in Edinburgh. The first six trains are currently being built in Hitachi’s Kasado factory in Japan, with the remaining 64 being built in Hitachi's flagship Newton Aycliffe train manufacturing facility in the UK. 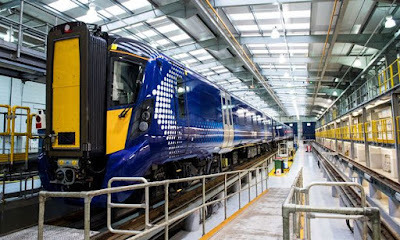 Transport Scotland’s Edinburgh Glasgow Improvement Programme (EGIP) is a crucial part of the new ScotRail franchise, and these new trains will play an important role in delivering extensive benefits for Scottish rail users and providing long term economic sustainability. Derek Mackay, Scottish Transport Minister, said: “With the new ScotRail franchise, a number of impressive infrastructure projects and these slick new trains, we are giving Scotland a railway to be proud of. “Passengers will love using these new trains, but the benefits go far beyond that. The use of electric trains on Scotland’s busiest route will help reduce our carbon footprint. The improved connection can only be good for our two biggest cities. And the innovative contract has reduced the cost of the finance, as well as guaranteeing a great deal for Scotland in the longer term.